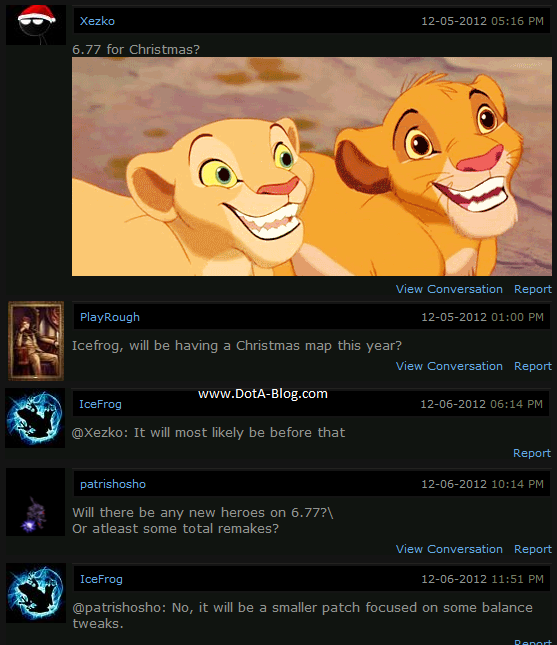 DotA 6.77 will Come Before Christmas! IceFrog recently has just put some comment in his profile page which let us know about the DotA 6.77 release date. We got several hints from his comments. The release date will be before Christmas and there won't be any new content yet, but we will get some balance and fix. However, personally i hope he will give us something for the Chistmas or New Year gift. Check out the below pictures for the details! Stay tune with us by follow our Twitter, Facebook or Google Plus so we can let you know when DotA 6.77 released! YES, zues uti miss ,last 1 hp. looking forward to the quest on the .x9 map, hope we will have one on 6.79.
u kNow viT waTer dRink it? ?